So Earth has some sister-planet where dinosaurs survived and developed a civilisation without feeling the need to undergo any physical evolution whatever? How’s he going to get that telescope up to his eye when he only has tiny little arms? Interesting chart, nothing but circles within circles. His chart seems to be a plank of wood, which may be handy if you’re sailing to Jupiter’s moons. If, like most dinosaurs, his vocabulary consists mainly of ‘Raaarr’, he might well be a pirate. 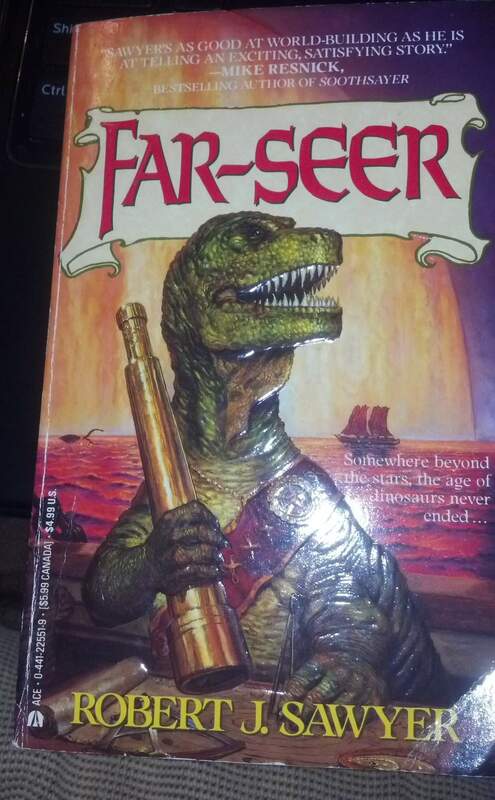 Because pirate dinosaurs in space is so much cooler than just dinosaurs in space. Though being an excellent far-seer… when he forgets his reading glasses he has to improvise! We can all be far-seers if we have a telescope. But how would he manage with binoculars? That’s my favourite bit in any Italian Restaurant — when the T-Rex waiter comes over with the gigantic pepper-grinder. This cover is exhibit B for my thesis that most sci-if/fantasy works can be improved by search-and-replacing the work “dragon” with “flying space t-rex”. Exhibit A is http://www.goodshowsir.co.uk/2012/07/the-second-experiment/ . Admittedly this t-rex has to use a boat to fly through space, but I believe the argument still stands. Ah, the cover art for the Quintaglio Ascension Trilogy. I feel like the illustrator was given no more than a tiny notecard describing what happens in each book. I wonder if Captain Rex here could also be related to Battledragon, as well as the star of “The Second Experiment”? Capt. T-Rex just looks so pleased with his life, here in a world “where the age of the dinosaurs never ended.” Maybe it’s because he has more fingers than your average dinosaur? Or maybe he’s thought of a funny joke to tell First Mate Plesiosaurus when he comes back from his swim on the far left of the cover. You guys should see the cover of the sequel, Near-Sighter.